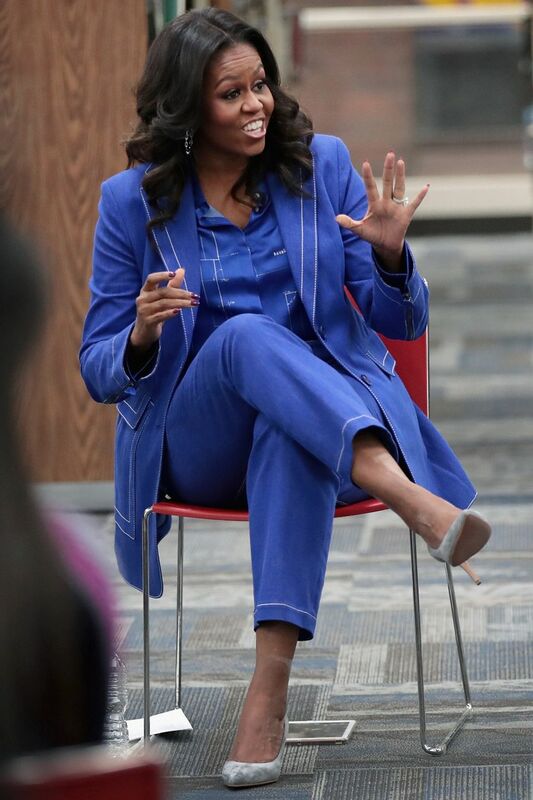 Michelle Obama showed why she’s one of the chicest former first ladies in the world as she attended her former high school (Whitney M. Young Magnet High School) yesterday to speak with the students. Dressed in a gorgeous rich blue suit which featured fresh threaded designs, the former FLOTUS looked absolutely amazing, giving us all the masterclass on how to do blue suiting. Accessorized with white piping, hoop earrings, and gray suede pumps, Obama’s outfit was a perfect mix of chic, confidence and effortlessly cool. Her visit to the school came just a day before the release of her book, “Becoming,” which she is scheduled to talk about with Oprah Winfrey about at the United Center today Tuesday. Meanwhile, keep clicking to see more of her roundtable pictures discussing with the students.